This is the only dish I know that’s been named after the sound it makes whilst it cooks (yes it really does bubble and squeak). It’s not a name that you’d expect to hear of a dish that uses up left over roasted vegetables. 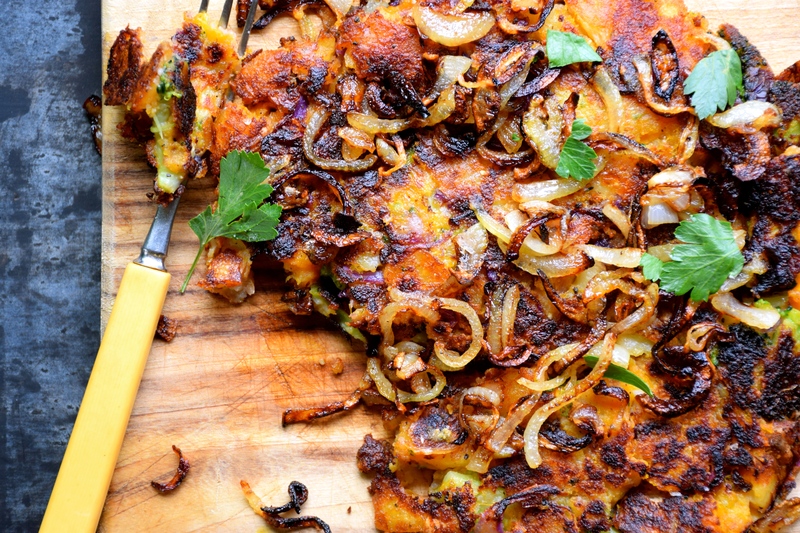 I’ve tried in the past to make bubble and squeak with freshly cooked vegetables, it just doesn’t work. Traditionally in England, they might add roasted brussel sprouts. I’m yet to try it with roasted beetroot, or roasted parsnips, but I suspect both of these in addition to potato would make an excellent base for bubble and squeak. 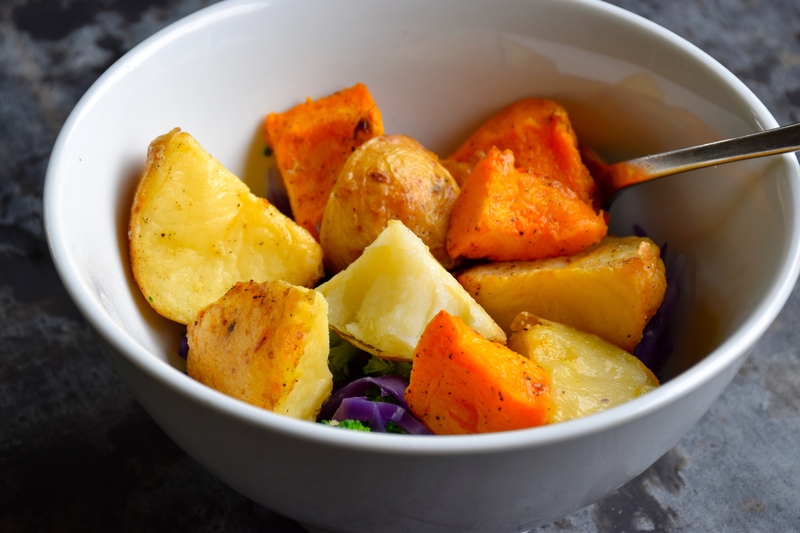 The hardest thing about this dish is roasting enough vegetables the evening before that you have them spare for the next day. At times I’ve been known to hide the remaining roasted potatoes so when my son asks if there’s any left I can reply, “no sorry- all gone”. Ha, a mother must do what she must do to make sure she has a chance of cooking bubble and squeak. Once you’ve done what ever you have to to ensure some left over roasted vegetables, you can then bulk out the mix with some freshly steamed ones. In this case I’ve used broccoli and cabbage, next time it will be kale and peas. A little besan (also known as chickpea) flour binds it all together, this gives the vegetables a base to hold on to. Is it time to put the oven on, and start roasting vegetables? Steam the cabbage and broccoli florets for 2 minutes, place in a bowl to cool. Add the day-old roasted vegetables and lightly mash together. Leave some chunky bits. Add the chickpea flour, season with sea salt and cracked black pepper and use your hands to squeeze the mixture together (this binds it nicely). Heat a drizzle of oil and a knob of butter in a small fry pan, add the onions and a pinch of salt, cook the onions on a medium-low heat for 7-8 minutes till caramelised and golden in colour. Heat 1 tbsp butter and 1 tbsp of oil in a medium sized non stick or well seasoned cast iron fry pan. When the pan heats and the butter starts to froth, press the vegetable mixture into the pan. Leave room around the edges to flip the patty over. At this stage turn the heat down so the vegetables have a chance to fry to a golden colour, shake the pan every now and then to loosen the vegetables from the edges. When you suspect the base is golden and crisp, use the biggest spatula you have and try to flip it in one go. 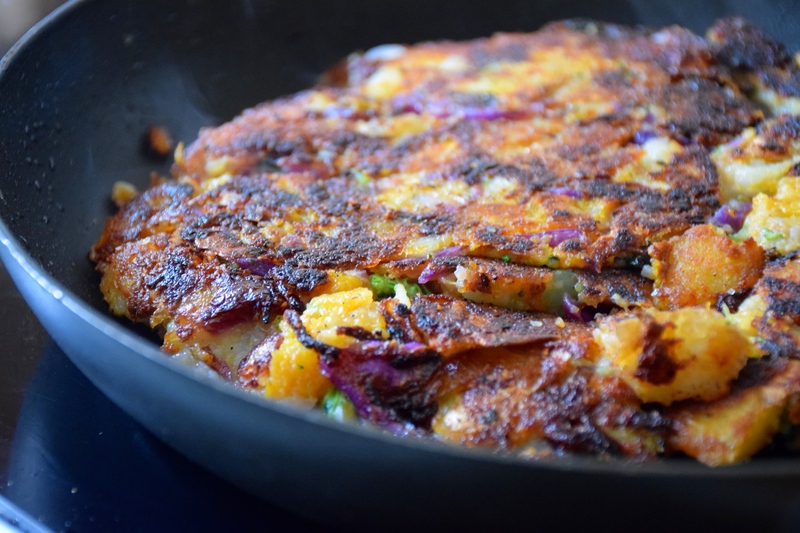 If this is impossible you can flip half of it then flip the remaining half and join them together again by sealing the broken pieces together with a spatula and lots of pan shaking (bubble and squeak wins no prizes for it’s looks so don’t be worried if it falls apart slightly). 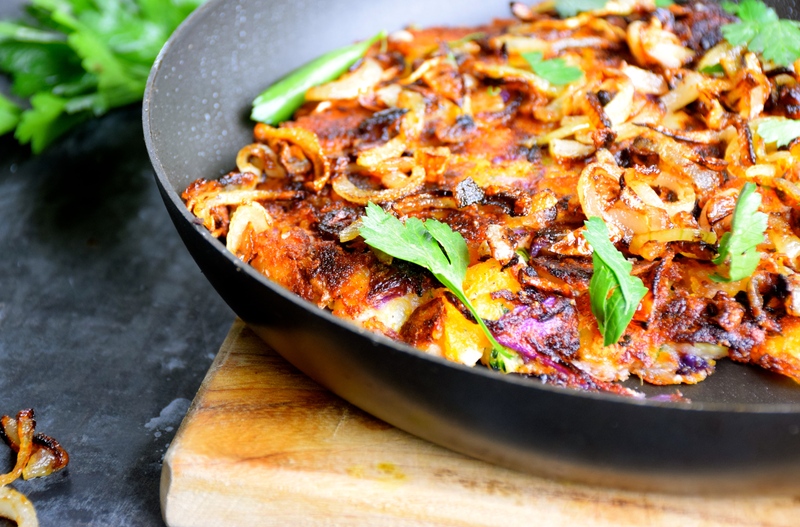 When the bubble and squeak is caramelised on both sides, slide it from the pan onto a board or plate, top with fried onions and garnish with parsley leaves. Eat whilst warm. Thanks Fae, I will check out your shabu-shabu. Fabulous Margot! I love it when I can inspire. I just love your blog and the way you cook. That’s so sweet! I admire the tasty things you cook on your wonderful blog. They all look so good.